Wow, I can’t believe this is my 50th weekly post. That means that we hagsaeng naebu have been writing these weekly posts for almost a year. Time sure flies. Anyway, this week I saw an awesome documentary about nutrition and holistic health. 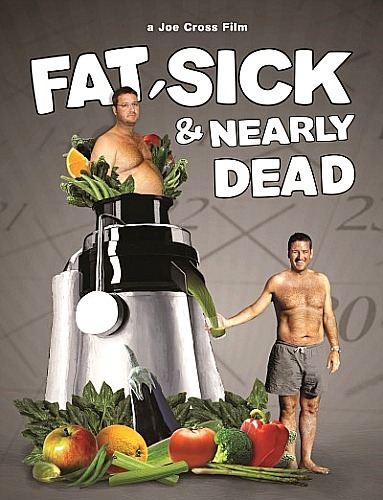 Last night, I watched Fat Sick and Nearly Dead that was produced by Joe Cross. The film discusses the disparity between what most modern Westerners eat verses what current studies and age old wisdom suggest they should be eating. The film asserts, and rather effectively demonstrates, that one’s food intake should consist mostly of fresh, raw vegetables and fruits; meats and dairy should only be consumed occasionally. As the film goes on, it also touches upon how proper nutrition not only affects one’s bodily health but can also benefit many other areas of one’s life such as emotional and mental well being. What I most liked about the film is the epic quest of self actualization it portrayed. Joe Cross begins a journey to heal himself when he realizes that “conventional” medicine is not helping him. At the beginning of his quest, he is a hundred pounds overweight and suffers from an autoimmune disease that requires him to consume several harsh perscription drugs everyday. His health is not good, and he strongly feels he must make a change in his life’s course if he is to live a long happy life. Cross is convinced that his body can heal itself and that the only reason it hasn’t already healed itself is because he has been inhibiting his body’s healing abilities by consuming junk food and other processed foods that tax the bodies systems. So he sets out on a sixty-day trip across America during which he will only consume juice produced from fresh vegetables and fruits. As Cross points out, when most Westerners hear the term “juice” they think of highly processed fruit juices that have lots of added sugar in them such as those made by Welches or Juicy Juice. The type of juice that Cross consumes in his film is juice that is made entirely from fresh vegetables and fruits using his Breville juicer (these juices are comprised mostly of vegetables). As Cross travels across America, he loses more and more weight and weens himself off the hard medications he previously depended on. All the while, he discusses nutrition and health with the Americans he meets. Cross demonstrates how his vegetable and fruit juice fast has returned his body to a state in which it can heal itself, and through this state Crosses body does become fully healed. The film takes a truly inspiration turn when Cross meets Phil Staples, a morbidly obese truck driver who is so ashamed of his weight that he can’t even bring himself to visit his own eight-year-old son. At more than 200 overweight, Staples is also racked with physical health problems. Staples takes on the challenge of going on a juice fast himself and altering his lifestyle to be more active. The path in front of Staples seems bleak and full of obstacles, but with discipline, willpower, perseverance, and a little coaching from Cross, Staples turns his life around and even goes on to inspire others to heal themselves and their lives through the same process. This is truly a story of achievement and inspiration. Fat Sick and Nearly Dead offers compelling stories of self healing and achievement. This film is a must see for anyone interested in healing, nutrition, or the principles of success. Cross’ film has inspired me to live healthier and strive harder towards my goals.I cannot say enough good things about this film. I loved it. Do yourself a huge favor and go see it. First off awesome as always , sir ….however I think readers need to remind that not only was he juicing but he was juicing organic fruits and veggies. Also that he consumed nothing else during this WHOLE time . Juicing alone is a pain but just juicing when you used to eating lots of meat and processed foods and then suddenly going “cold turkey” like he did….is just amazing but the results were even more of a miracle. Yet again another amazing blog post. Keep up the good work. Excellent points: in case I wasn’t clear, during his sixty day juice fast Cross only consumed fresh, raw, organic vegetables and fruits, and he only consumed these wholesome juices throughout the entirety of his fast. As always, thanks for reading.